You remember Zdenek Stybar don’t you? No? 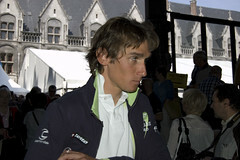 He’s the eight year professional with Omega Pharma Quick Step last seen being nerfed out of the race at Paris Roubiax. After an injury blighted season the cyclo-crosser come road racer resurfaced at last weeks Eneco Tour and not only won two stages but the overall as well. It could well have been three stage wins out of the seven on offer, but the Czech rider just missed out to Team Sky’s David Lopez who won stage 6 on the legendary La Redoute climb. Describing his win as “..dream come true” after knee surgery that forced him to miss this years Tour de France Stybar triumphed across a parcours that featured many of the ascents that feature in the Belgian spring classics. Winning the final stage was the icing on the cake but the party was almost spoiled by another member of the Sky squad bidding for a stage win. Ian Stannard may be developing a bit of a reputation as a bridesmaid after hard graft results in someone else taking the glory, but ‘Yogi’ has enhanced his reputation again here following his dogged pursuit of the win at this years Milan San Remo and a strong support role at the Tour. Stannard is without doubt an ‘engine’ which may not be to his advantage in the cat and mouse game that is the final kilometre of a stage. However, he does look like a rider that can do a job for Sky on this type of terrain. 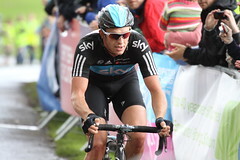 He’s likely to have protected status for the classics next season, but Sky’s team leader may yet have to show his face. INRNG suggests that Sylvain Chavanel will be riding for a Pinarello shod team next season. It’s hard to imagine Movistar prioritising the classics and Sky need a ‘face’ who’s a proven winner in the Juan Antonia Flecha mould (ah.. hold on a sec.. should say potential winner). With Sky rumoured to have courted Fabian Cancellara before he re-signed with Trek, the need for a marquee classics signing increased and Chavanel fits the bill. Unfortunately for Sky, the UK is more likely to inspire stage race and grand tour wannabes as the country continues to ride on the wave of interest sparked by multiple Tour de France wins. In the short term they may have to rely on brought in talent from overseas to realise their goal of a classics win. The had been talk of that student of road racing history and folklore Sir Bradley Wiggins bulking back up for a tilt at Paris Roubaix. Wiggins followed up his low key return to racing in the Tour of Poland with a similarly disinterested appearance at Eneco. In Poland intentions were clear with Wiggins surrendering his leaders position to Sergio Henao. A week or so later in the low countries and with a strong team around him, the sight of Wiggins going out the back on stage one was a pretty strong indicator that he wasn’t focused on the GC. The often mis-firing Sky PR machine was wheeled out with the big reveal that he would be going for victory in the TT, further preparation for the world championships in September. The TT stage over a not quite prologue like 13 or so kilometres was technical, not the length or route that Wiggins would chosen, but expectations would have been high for a win. A sense that the wheels were coming off at least figuratively became apparent when Radioshack’s Jesse Sergent crossed the line 15 seconds faster. Ironic if Chavanel is Sky bound as it was the French TT winner who ended up taking the stage. Taking everything into account about the distance and technical nature of the course this is more of a bump in the road as opposed to the kind of setback that Wiggins endured in the Giro. There’s a sense that he is still something of a fragile character after Italy, so the focus on his strongest discipline is understandable. While Chris Froome was arguably the stronger on the climbs during Wiggin’s Tour win in 2012, Froome is yet to beat him against the clock. If anything Wiggins seems to become more reconciled to his position in the team with interviews over the last few weeks describing how he wouldn’t expect to lead a GC assault if Froome was in the same squad and now indicating a return to track cycling for the 2016 Olympics. The weeks racing was interesting also for the ability of individual riders to upset the bunch sprint. This was played out to greatest effect in stage 1 with a sprinter actually causing the break. Whether by accident of design Omega Pharma destined Belkin rider Mark Renshaw pulled off an enjoyable (for this viewer anyway) upset that seemed to surprise most of the peloton and maybe even some of his teammates. There’s a link to Renshaw’s power data for the stage on our Facebook site. Wiggins isn’t the only rider having a year to forget. Current world road race champion Philippe Gilbert had another week to forget at Eneco and is without a win this year. If there is a ‘curse of the rainbow jersey’ there aren’t many better ways to illustrate it. Gilbert won a stage at last years Vuelta with a similar uphill finish to his favourite Fleche Wallone. How he (and BMC) will be hoping for a similar result for this years race. Which leads us neatly on to..
After the hype ahead of this years Giro and the 100th Tour the 2013 edition of the Vuelta a Espana is facing an uphill struggle for attention every bit as steep as the Alto de L’Angliru. Last years edition benefited from Alberto Contador’s return to grand tour racing. Not surprisingly, Spanish riders are always up for the home races and last year was no exception with Alejandro Valverde and Joaquim Rodriguez joining Contador in the GC battle. Hard as it is to imagine after his dominant form this year that the 2012 Vuelta was the first race for Chris Froome as an official team leader. Froome, fatigued from his efforts supporting Bradley Wiggins in the Tour, faded as the Vuelta’s climbs became steeper and eventually finished far from disgraced in 4th. The early leader was Rodriguez, but he was to experience disappointment again as with his runner up spot in the Giro earlier the same year. Rodriguez was expected to lose his lead to Froome or Contatdor during the TT, but he survived until Contador attacked on a relatively innocuous looking stage 17 and rode away for the stage win. 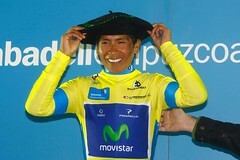 Rodriguez left exposed on the stage took another kick as a resurgent Valverde overhauled his 2nd place. Contador, whatever anyone might think of his provenance looked imperious and anyone watching would have predicted that 2013’s strongest rider was likely to be the recently returned Spaniard. The race was notable for the emergence of John Degenkolb, who dominated the sprint stages for Argos Shimano, taking five altogether. VCSE’s stage of the race was the solo win by local pro-conti Caja Rural rider Antonio Piedra at the iconic Lagos de Covadonga. So, what of this years version? Just as the Tour, last years winner is missing. Contador pulled out from the race before the Tour had even finished and Saxo Bank will be led by Contador’s ‘shadow’ at the Tour Roman Kreuzinger. Froome has massively transcended his situation from last year, where team leadership at the Vuelta was his reward for helping Wiggins at the Tour. Based on that train of thought might we have expected Richie Porte to lead Sky in Spain? No, Froome and Porte are in the US for the Pro Challenge. Sky as they are minded to do will probably select their Spanish riders like Lopez and Xandio in support and lead with the Columbian’s Rigoberto Uran and Sergio Henao. Team leader will probably be Henao. Uran’s departure to Omega Pharma will be a mark against the rider who if not physically stronger, seems to have the psychological edge over his compatriot. Although they have had a month to recover it remains to be seen if Rodriguez or Valverde can summon up the reserves to take them two or one place further respectively this time around. Valverde’s Tour fell apart after the wind effected stage from Tours in week two. Shorn of team leaders responsibilities he was able to animate the race in the final week, peaking similarly to the Vuelta last year. For all of the success Valverde’s Movistar team have achieved with several stage wins in this years Giro and Tour, it’s the Vuelta that is the biggest prize for a Spanish sponsored and based team. The Columbian connection continues with AG2R bringing Carlos Betancur. Betancur’s performances in the Giro have been overshadowed by Quintana’s Tour successes, but the AG2R man should come into the race with fresher legs. Rodriguez looked ecstatic with third place in the Tour but surely has ambitions beyond a podium place at every grand tour. Dan Martin will lead Garmin and has said that he is going for GC, but may be better placed for stage wins, the aim of Orica Green Edge. With extinction looming riders from Euskatel will be looking to put in some strong performances in their home race to reinforce their pitch for a new berth next season. It’s disappointing that so many riders have publicly declared that they are using the Vuelta for training but this should at least allow for allow for some open racing. There’s some interest in the wild cards too with Net App Endura securing an invitation to this years race to provide some Anglo German interest. So, we have mentioned riders returning to major action since the Giro like Betancur and Uran, but what of the Giro winner. Vincenzo Nibali, the only rider to have beaten Chris Froome in head to head competition this year has performed in almost as low a key as Wiggins since his Giro win. Knowing the Italian was missing the Tour this year to focus on the Giro it was reasonable to think that he would tilt at a Giro Veulta double. Since then Nibali has announced his late season focus is on the world championships being held in Florence in September. A Nibali in form, the same form as he showed in the Giro and earlier in the season, would be an easy prediction for the overall. Nibali is a pretty straight shooter so if he says he isn’t going for GC it will be pretty clear if it’s a smoke screen when the race starts going uphill. For the second year ITV4 will be showing an hour long highlights show. Live coverage will be on Eurosport (this obviously applies for UK viewers). Stage 8 (Saturday 31st August) Jerez de la Frontera to Estapona – Actually a cat 1 summit finish with the race visiting the far south of the country. Stage 15 (Sunday 8th September) Andorra to Peyragudes – The longest stage of the race crossing into France and over the Col de Peyresourde and 3 more 1st Cat climbs. Stage 20 (Saturday 15th September) Aviles to Alto de L’Angliru – The traditional penultimate stage with the Hors Category summit finish. As the late, great Kenneth Wolstenhome said “They think it’s all over..” and with one stage left to shuffle the GC classification it’s hard to see Team Sky’s Chris Froome losing his lead and the Maillot Jaune. VCSE’s prediction for the 2013 Tour de France looks safe, but as we went for most peoples favourite it was a pretty safe bet. Froome has ridden a dominant race. He has won two stages in the final week including Sunday’s summit finish at Mont Ventoux and the rather more closely fought second Time Trial stage in the Alps on Wednesday. After winning the first stage in the Pyrenees on a very similar profile the likelihood was that Froome could achieve the same outcome on Ventoux as he had done at Ax 3 Domaines. The resemblance between the stage profile was mirrored by the result as Movistars Nairo Quintana attacked only to be reeled in and eventually defeated by the Sky mans pace. And rather like his first win this year it was Froome’s pace that gathered the most headlines afterwards. Whether it’s the first post Lance ‘confession’ Tour or a dig at the rider / team or a combination of all three Team Sky in general and Chris Froome in particular have suffered a huge amount of scrutiny during this race. It had reached enough of a crescendo on the second rest day that Sky decided to counter punch with the release of Froome’s power data to L’Equipe and his biological information to WADA. It’s possibly a little unfair on the rider that he has had to deal with the volume and intensity of “Is he doping?” questions that come his way, directly or indirectly via social media. In previous generations (read pre Lance) the way Froome has gone about his attempt to win this Tour would have been celebrated. Three stage wins, including two summit finishes and the way he rode unsupported for an entire day in the Pyrenees is the stuff of legend. Yet he has been dogged by the doping question throughout the race in a way that only in the last couple of days (and perhaps not until the race finishes) has the tone of the reporting calmed down. In contrast to Sky’s erstwhile team leader Wiggins, Froome seems not to want to cause offence and perhaps an expletive laden rebuttal a la Wiggo might have silenced some of the doubters. The media have been quick to jump on any unfortunate quote or quip from the race leader to try and illustrate a tenuous guilt by association to the Tour’s fallen idols, but at least the sideshow appears to be abating now that Sky have wrested back control of the agenda with their information release. It has felt a bit like the only thing that could derail the Sky train this year was themselves. In 2012 Sky established complete control over the peloton and while breakaways happened the rivals that mattered were kept firmly in the place by metronomic, power metered pace. This suited a team leader like Bradley Wiggins who essentially has one gear, but in 2013 Sky have Froome who is able to deliver multiple changes of pace even if he could be an illustration to define the phrase ‘win ugly’ with his all arms and legs riding style. And how they have needed Froome this year as the Sky train has been largely non existent. Other than his summit wins, the supporting cast (with the notable exception of Richie Porte) have been bit part players often falling away when Sky’s rivals have had domestiques in hand. Pete Kennaugh had another good ride on the Ventoux stage, but the other riders have suffered in comparison to say Movistar and Saxo Bank’s supporting cast. Of course, Sky lost Vasil Kireyenka early in the race, but they lost a similar engine last year without the same effect. Froome will n0 doubt show a great deal of humility and thank his team if he wins, but for VCSE at least the seeds for the victory were laid when he was alone in the Pyrenees on stage 9. When Chris Froome is casting around for people to thank he should also spare a thought or two for the respective managers and strategists at Movistar and Saxo Bank. As brave as Froome was across the cols of the Pyrenees his opponents were indecisive or unwilling to deliver a fatal blow allowing the Sky rider to retain the lead and be in a position to consolidate it during the first time trial. Other than an opportunistic break on the wind effected stage 13 by Saxo Bank the opportunities to put some hurt onto Froome and Sky have largely been missed. For Saxo Bank Alberto Contador has been ably supported by Roman Kreuziger to the extent that the Amstel Gold winner has a solid top 10 result to look forward to. Contador had said he had his “..strongest ever team” going into this Tour but even if his teams tactics have been misplayed even Alberto admits that he cannot match Froome one on one. Whether climbing the Ventoux or on the second ascent of Alpe d’Huez Contador just hasn’t had the legs to see off the Maillot Jaune. It was Movistar who had put Sky under pressure on stage 9 and Nairo Quintana who looked like their rider most likely to profit from a Sky slip, but the Spanish team suffered from not knowing which horse to back. Alejandro Valverde’s untimely wheel change on stage 13 settled that but while Quintana was able to move up the GC and take over the young rider classification it was hard to see him challenging to overhaul the top two. Where Movistar have profited this week is from stage wins from breaks and it’s all thanks to just one rider. 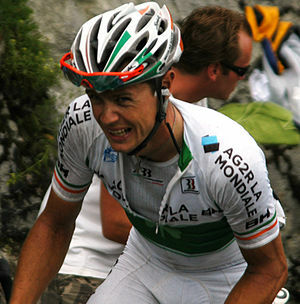 Rui Costa book ended the second TT and the Alpe d’Huez stages with two fine solo victories. VCSE predicts a swansong for Valverde in this years Vuelta, but expect to see Costa and Quintana as the GC hopes for Movistar next year. With neither Movistar or Saxo able to put Sky under much pressure in the Alps this week the excitement has needed to come from elsewhere and Thursday’s queen stage to Alp d’Huez had all of this and more. Encroaching fans on climbs are probably considerably more frustrating to negotiate for a rider than they are borderline tedious to the armchair viewer. The fans lining the hairpins on the Alp take things to a whole different level however. For the leading group any hope of attacking on the climb was ruled out in favour of just surviving the no doubt well-intentioned gauntlet of fans. The second and final ascent fell into two distinct halves; those riders that still had something to race for and those who would be just happy to finish and ‘would have that beer thank you’ as they passed Dutch corner. In the 100th Tour no French rider had one a stage before the Alp and for a large portion of the race that looked as if it would remain. BMC’s Tejay van Garderen had imploded in the Pyrenees and this was going to be his salvation. A mechanical on the descent of the Col de Sarenne held him up for a while but he was the first rider onto the Alp for the final ascent. His lead began to plummet as he climbed and the remnants of the peloton raced along the valley floor, but of closer and more urgent concern was the pace of AG2R’s Christophe Riblon. Riblon had finished second to Costa earlier in the week and must have felt the weight of that near miss along with the need to win something for the team after his teammate and highest placed French GC rider Jean-Christophe Peraud had abandoned after a double crash and fracture on the previous days TT. As both riders emerged from the crowds into the barriered section of the course it was clear that the Frenchman was catching Van Garderen. You had to feel for the American and as Riblon closed in thoughts of the two riding together Hinault and Lemond style to the line flickered. But no, Riblon showed no mercy, riding past without a moments hesitation and any suggestion of ruthlessness towards Van Garderen was quickly forgotten as the prospect of a French stage win on this stage in this race dawned over the fans, the commentators and the viewers at home. Alongside Chris Froome’s solo battle on stage 9 in the Pyrenees and with two stages still to go a contender for the stage of the Tour. Today’s stage promised much but didn’t really deliver. The second win for Costa was well taken, but Sky seemed to be given a fairly easy day on a potential banana skin parcours. Of course there is one more GC stage to come, a short and sharp 120 kilometres to Mont Semnoz outside Annecy. Will there be a last roll of the dice? Taking more than 4 minutes out of Froome at this point would probably involve an attack of epic proportions from Saxo and or Movistar from the flag. VCSE’s view is that the opportunity has passed and if anything changes tomorrow it will be the podium places. Katusha’s Jaoquim Rodriguez has climbed up the GC this week and he could be the rider to shake up the places in search of a podium spot. Otherwise it’s down to the teams and riders that need to make an impression with time running out for them; an Andy Schleck or Jakob Fuglsang perhaps? And so we will leave the mountains and head for the nocturne in Paris. Can Mark Cavendish get five in a row on the Champs Elysee. It will no doubt come down to which sprinter has left enough in his legs following a week in the Alps, but the VCSE Top 3 prediction would be from these; Cavendish, Greipel, Kittel. In the last Racing Digest we talked about the 2013 Tour de France starting for real as the peloton entered the Pyrenees last weekend. After its offshore sojourn on Corsica and the practical annexation of the Maillot Jaune by Orica Green Edge in week one, the general classification dice were due to get their first roll. 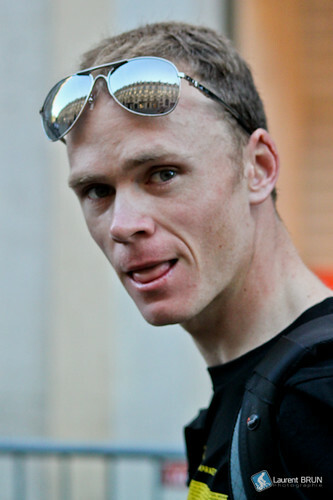 From the outset Sky’s Chris Froome has been VCSE’s and most people’s favourite. Froome demonstrated his superiority on the Tour climbs in 2012 and when riding a similar profile this year from Oman to the Alpes he has been in dominant form. Froome weakness and indeed that of 2012 Tour winner and erstwhile Sky team leader Bradley Wiggins is on the steeper ramps that don’t feature in the ASO’s idea of what a parcours should look like. Although key rivals like Alberto Contador and Joaquim Rodriguez missed the Tour last year, their form so far this year positioned Froome as the man whose race this was to lose. The question was; who would show their hand first in the mountains? Stage 8 with a summit finish also featured this years highest col at Pailheres, just over 2000 metres at its crest. There’s a special award named for Tour founder Henri Desgrange for the rider who reaches the years highest climb first and it was Nairo Quintana who managed this convincingly. VCSE’s tip for the King of the Mountains classification made the climb look easy, although as Paul Sherwen pointed out (several times!) a climb over a pass at 2000 metres should hold no fears for a rider who was born at 3000 metres. Whatever advantages his birthplace gave Quintana on the way up, they didn’t extend to his ability to descend. Whether there was a rider in the field that could have skipped up the Col de Pailheres as lightly as Quintana we’ll never know, but the drop into the valley called for the sadly absent Vincenzo Nibali. Quintana is no Nibali and as he made a mess of his lines into the valley before the final ascent to Ax 3 Domaines the leaders began to peg him back. Froome was enjoying the typical assiduous Sky close support. Peter Kennaugh, a Tour debutant but long since identified as a GC ‘prospect’ buried himself to get Froome and Richie Porte to the final climb in the perfect place. For Phil Liggett and Paul Sherwen this was almost too much after the Quintana show, both commentators seemingly about to suggest that Kennaugh had “..come from nowhere”. Froome isn’t the surprise package anymore and his demonstration on the climb to Ax 3 Domaines showed his superiority. Quintana, now within touching distance of the chasing group was dispatched by a burst of speed from Froome that he continued and suddenly it was him alone ready to ride into yellow. There were shades of the Criterium International from earlier in the year as Froome rode away and Porte, realising that no one was getting up from the canvas, kicked on himself to deliver a Sky 1-2 and the race lead for Froome. Other than Quintana’s cameo, it was an almost depressingly dominant performance from Sky with Froome and Porte going first and second on GC and the emergence (for Liggett and Sherwen at least) of Kennaugh. The following morning’s L’Equipe headline ‘A First Round Knockout’ summed up the consensus view that the Tour was as good as over. The second and final day in the Pyrenees made all of the conclusions jumped to seem extremely foolish and certainly premature. A case is sometimes made for televising the early part of a stage ‘live’. Dependent on your choice of feed, the opportunity to see the chess match that is played out as the teams agree just who will be allowed to form a break is something that might never be seen. The armchair fan is reliant on the presenter and / or commentator to fill in the gaps and describe just how you come to be watching the race that has developed. Thanks to the joys of social media it was pretty clear on Sunday that scripts written less than 24 hours ago were being torn up across the press, TV and peloton. Whether by deals made in smoke filled rooms or just pure synchronicity between the teams the plan for the day seemed to be let’s all attack Sky. And up to a point it worked. Viewers watching the ITV feed joined the action to find Chris Froome alone. The previous days revelation Peter Kennaugh had taken a tumble off the road and was struggling to get back to the lead group, but the regular ‘engines’ of the Sky train Suitsou, Kiryenka and Porte had apparently blown in the face of a mass team effort from Movistar. With three first category climbs left and his GC rivals circling you waited for Froome to be delivered a final fatal blow, but none came. As commentary shifted between discussing what had happened and what might / should happen next Froome dug deep and hung on. He showed the biggest balls of all when responding to digs from Quintana on the final climb over La Hourquette d’Ancizan. VCSE had tipped Garmin’s Dan Martin as someone who could pull off a win over the weekend and already well down on GC, his attack with Astana’s Jakob Fulsang was allowed to go late on the stage. Froome maintained the 1.25 advantage he had enjoyed over Alejandro Valverde going into the stage, the difference being that he was now in second place, Porte had fallen out of contention completely. Worse still for Sky was the news that Kiryenka had missed the time cut depriving Froome of one of his most powerful domestiques. For the Tour, Sunday was the best result possible. Although the favourite was still in yellow, it looked like there was still a race on. Froome deserved as much credit for his solo effort as his win the previous day. For his competitors questions remained as to why no one had delivered the killer blow to Sky’s isolated team leader. Certainly for all of the effort they put in Movistar had not appeared to get much from the stage. If nothing else as the peloton looked forward to the first rest day, they had established something: Sky were human after all. After the excitement of the Pyrenees Sky were perhaps glad of a week of stages where the yellow jersey wouldn’t be under much threat with an interlude for an individual time trial where Chris Froome would be very much the dominant rider. In week one sprint honours had been split relatively evenly with Mark Cavendish, Marcel Kittel, Andre Greipel and Peter Sagan all taking wins. Sagan was proving dominant in the points classification having been there or thereabouts at the last even if he only had one victory to his name. Marcel Kittel who had upset the Cav in yellow storyline in stage one was first to strike again in week two taking the win on stage 10 to St Malo. There was no controversy for Kittel in victory, but the waters that ebb and flow around Mark Cavendish became stormy after he appeared to nudge Kittel’s Argos Shimano teammate Tom Veelers off during the sprint. 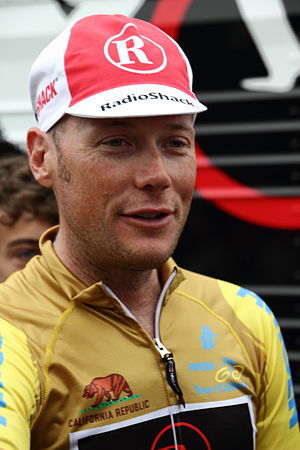 The opinion that counts in these situations (the race officials) said “no foul”, but not before some heat of the moment interviews had taken place that resulted in Cavendish stealing a reporters tape recorder and Veelers saying Cavendish was at fault. Peace was restored pretty quickly and Cavendish presented a cooler head later on via social media that redeemed him at least as far as VCSE is concerned. The stage 48 hours later told perhaps a bigger story when Cavendish seemingly poised for victory was denied at the line by Kittel for his second win in three days and the third win by a German rider in as many days. Whether Kittel’s win signified a change at the top of the sprinters tree remains to be seen although that could be answered to an extent next Sunday on the Champs Elysee. With Peter Sagan holding onto a strong, if not unassailable lead in the green jersey competition a win in Paris could already have been inked in as Cavendish’s priority for this year. Kittel shows no fear where Cavendish is concerned and his Argos team have been every bit as determined as Omega Pharma to get their rider into the right place at the right time. With the Alp’s fast approaching it’s going to be interesting to see who comes out the least damaged of the sprinters group a week tomorrow. Sandwiched in between the sprints; the TT. Omega Pharma’s TT world champion Tony Martin had a long wait in the hot seat thanks to his lowly position on GC. As befits the Maillot Jaune Chris Froome was last to leave the starters hut. Part one of the test was to put time into his GC rivals. Mission accomplished as Valverde, Contador, Evans and others lost chunks of time reinforced by a ride from Froome that as late as the second time check suggested a second stage win. Denied by a change in wind direction, Froome could still feel happy with an additional two minutes lead over his closest rival Valverde. Sky still weren’t having things their own way. With the focus naturally on the GC, on sprint stages Edvald Boasson Hagen had been given the licence to go for the win and had delivered some decent results in week one. On stage 12 into Tours an accident in the final stages costed Sky another rider as Boasson Hagen crashed heavily and broke his scapula. Despite the Norwegians exit the following days stage looked easy enough, with little climbing and a likely sprint finish. What no one anticipated was the cross wind that first detached a group of riders including Marcel Kittel. Next to fall victim was Valverde, puncturing and forced to take a wheel from a teammate. At the other end of the race, Saxo Bank marshalled by ex Sky road captain Mick Rogers saw Froome well back in the peloton and forced another split. Missing helpers Froome eventually had to admit defeat and lost over a minute at the end. Valverde’s challenge was over, but now Contador was back in the hunt. Cavendish, who had been the last rider to make the break, took the stage win. Froome still had the lead, but his advantage had dropped to less than 2.30 from in form Bauke Mollema who had been installed as Belkin team leader just before the Tour started. The stage could have been described as a breakaway win, but in its purest sense today’s stage to Lyon was a breakaway proper. On the anniversary of Tom Simpsons death, David Millar was part of the large group that got away. Millar didn’t have the legs in the end, but the heartbreak was felt most by Sojasun’s Julien Simon who came so close to delivering the first French win in this years Tour. 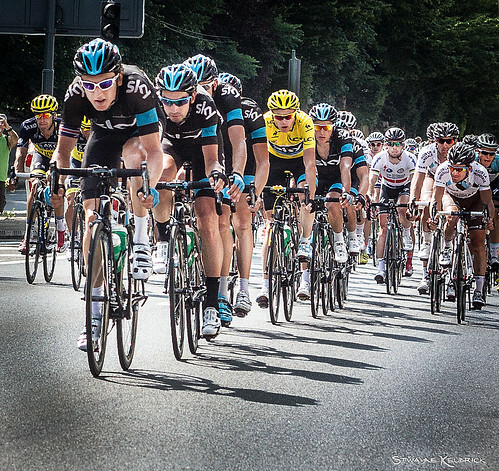 Omega Pharma got their third win this week instead with Tour debutant Matteo Trentin. And so week two closes and the final week of Tdf 2013 begins with a massive stage and summit finish at Mont Ventoux. In all likelihood the action before the ‘Giant’ will be between the French teams desperate to get someone strong into the break on Bastille Day. It could be a day for Pierre Rolland or even Thomas Voeckler who has been pretty anonymous so far. As there is no descent involved it might also be time for Thibaut Pinot to show himself. The VCSE view on the stage is that the profile will probably suit Froome as it has some similarities with the stage to Ax 3 Domaines. Even if he is alone for the climb, Froome has shown he has the legs to ride away on a single HC climb. Don’t anticipate to many changes to the GC tomorrow, but as for next week; when the race gets to the Alps Sky will have a real battle on their hands. First up Amstel Gold. The race has traditionally finished at the top of the Cauberg, but aping last years World Championships the line has moved to a kilometre or so along a nondescript straight section of Dutch A road including that staple of the town planner a mini roundabout. Whether or not the race benefits or even needs the change is questionable. However it does alter the dynamic of the race and potentially opens up the field of potential winners. Philippe Gilbert’s breakaway on the Cauberg at the World’s gave him the winning advantage and he was heavily trailed as a potential winner of the race, perhaps even to repeat his 2011 record of wins in all three Ardennes classics. Gilbert had been absent from the Ronde after succumbing to a virus after this years snow affected Milan San Remo and used the Tour of the Basque country to prepare for this week. The breakaway at Amstel which included Garmin’s Johann Van Summeren and Mikel Astarloza of Euskatel. Euskatel had been abject at their home tour. It hardly looks good when you are one of the weakest links in the pro tour and a rider you have dropped animates most of the stages and wins the KOM jersey. Astarloza looked like he was making a point on behalf of the team and at takes some credit for being the last of the original group to get caught. With the distance to go in the race at this point it should have been time for the peloton to start getting into position for the final climbs. BMC for Gilbert, Movistar for Alejandro Valverde (or even Nairo Quintana) and Astana last years winners with Enrico Gasparotto couldn’t or wouldn’t get organised but even as the race entered the final lap the eventual winner and how the race would be won wasn’t obvious. A number of riders were now pinging off the front but these looked more like tactical efforts rather than genuine attempts to go for victory. Riders bitched about who would or wouldn’t take their turn on the front of the little groups that formed. Watching the final moments unfold it wasn’t clear whether Roman Kreuziger’s solo away from the breakaway group was an opportunistic dig or the realisation that he could get away and perhaps even stay away from his rivals. Whatever, Kreuziger looked in great shape. Ryder Hesjedal who did a huge pull to get up to the break presciently summed up the chances of catching Kreuziger with the way he shook his head when he realised that since he had gapped the main group that Kreuziger had ridden off into the distance. Gilbert was probably always going to attack on the Cauberg. Closest rival was Valverde who looked content to follow Gilbert’s wheel up the climb, he in turn stalked by Simon Gerrans the Omega rider adept at snatching a result this way. By the time these three reached the summit Kreuziger was already on his way to victory and able to ease up as he approached the line. For Gilbert it was clearly win or nothing as he sat up on the line to allow Valverde and Gerrans take the podium places. Reaction to Kreuzigers win was a mixture of surprise and a feeling that maybe, finally, his talent had shown itself. Ironically Kreuziger had ridden for last years winners Astana before joining Saxo Bank this year. And so to Belgium for the Fleche Wallone. Phillipe Gilbert was being touted for this one too. Last years victor Joaquin Rodriguez had fallen at Amstel but a rapidly improving prognosis saw him take the start. 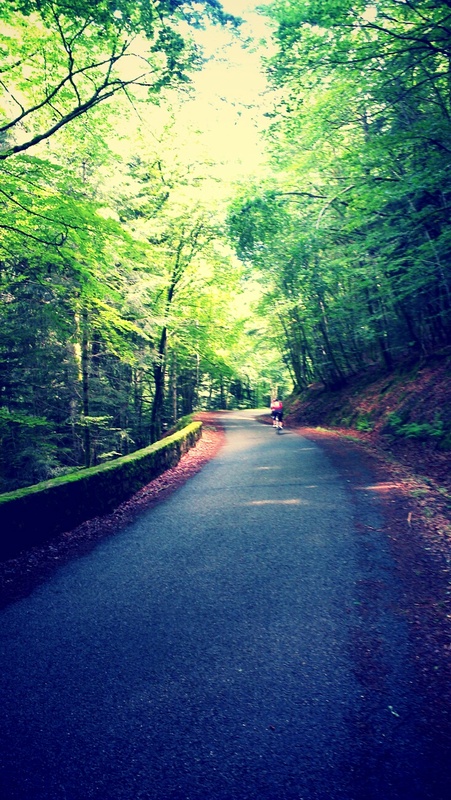 Rather like Milan San Remo where the joke goes that the neutral zone lasts for 280 kilometres until the Poggio, Fleche Wallone didn’t come to life until the final climb of the Mur de Huy. BMC had done a better job of controlling the race but as the Mur approached Gilbert was pretty much unsupported. Carlos Betancur from AG2R who had been nerfed out of a stage win in the Basque country a couple of weeks ago attacked early and put a big gap between himself and the group that stayed as the hardest section was passed. Gilbert realising it was now or never, responded although whether this was because he realised Betancur was a genuine threat or the presence of Peter Sagan alongside him wasn’t clear. Sagan blew up pretty much immediately and Gilbert soon followed him, seeming to acknowledge today wasn’t his day (again). Betancur approaching the line was running out of legs as Dani Moreno (Katusha) began to ride clear of the field and overhaul second place man Sergio Henao of Sky. Maybe Moreno was feeling super strong up the Mur or maybe Rodrigeuz, aware that he didn’t have the legs gave him the nod. Moreno’s surge to the line was irresistible , too much for Betancur who expired at the last to hand second place to Henao. Getting pipped by Henao, the rider who beat him up in Spain probably didn’t improve Betancur’s mood as he reflected on the merits of attacking early against pro tour riders. Nevertheless Betancur is a prospect and a potentially astute signing for AG2R as a rider who could potentially breakaway on the mountain stages at this years grand tours. For Moreno, like Kreuziger earlier in the week it’s the biggest win of his career.. so far. What would probably normally be a ‘B’ team outing for the peloton through what seems like the cream of Italy’s hydro-electric infrastructure was supposedly going to be enlivened by the presence of Bradley Wiggins using the race as warm up for next weekends start in the Giro proper. Wiggins was joined by such other notables as Cadel Evans and Tirreno Adriatico winner Vincenzo Nibali. The scene was set for a contest in bragging rights, or was it? Unlike their somewhat lacklustre performances in the classics Sky can be relied upon to set the pace at the front in stage races. Day one at Trentino saw a split stage with a team time trial making up the latter of the days racing. Whether by accident or design Sky didn’t ride and the rest of the peloton didn’t get orgainised. Result? The breakaway was allowed to stay away and with only four days racing to follow the possibility of a (relative) unknown winning was becoming the nightmare scenario for organisers and media alike. If not Sky’s then certainly Wiggins frustration was revealed on the podium after Sky took the team time trial at a gallop pulling back a minute on the GC going into day 2. Maxime Bouet of AG2R rode into the leaders jersey on the second day and was defending just under a 4 minute advantage over Nibali as the race entered its final day with the queen stage to Sega di Ala. Typical of many an Italian (if not Spanish) mountain stage the switchbacks up the climb increased to 20% in places but those settling back to enjoy a battle between Wiggins watching the power meter and Nibali putting in little digs to try to force an advantage were disappointed when Wiggins Di2 failed and the recalcitrant Pinerello was thrown against the cliff. While his mechanics were thanking their deity that the bike had something solid to hit rather than being pitched over the side of the mountain Wiggins set off sans SRM on a replacement bike. While it’s known that even the pro teams account for every single item and will only discard a piece of kit if it is genuinely a write off it was surprising to see that Sky did not equip the replacement mounts with a power meter. This isn’t actually unusual within the peloton, but for team like Sky who seem pretty much a slave to how many watts they can churn out it seems like a bit of an oversight. With Wiggins out of the picture it was left to Nibali and one time doper Mauro Santambrogio of Vini Fantini to fight it out for the stage win and potentially the overall GC. Santambrogio had been in the mix at Tirreno too and is certainly one of the strongest climbers in the pro-conti field. Nibali prevailed over the worst of the ramps and was able to time trial to the line. For Bouet it was a question of whether he could make it to the line within 4 minutes of Nibali’s time. Neutrals couldn’t help but cheer him on to what would be by far the biggest result of his career to date. There was a sense that Bouet realised before the line that he hadn’t done enough but against the quality of field that turned up in the Trentino his podium place is certainly no disgrace. Would Wiggins have beaten Nibali without his mechanical? VCSE suspects not. While Wiggins looks stronger than he did against the sudden accelerations that Nibali employ’s like teammate Chris Froome he looks less at ease on the steepest ramps. When Sky can control the race they look imperious but if the other teams can keep riders in hand to animate things it’s hard to see Wiggins coming up with a different result to this one against Nibali.